The Blue Ridge Mountains Pickleball Club members have been on the move in June, visiting other area clubs for inter-club play. 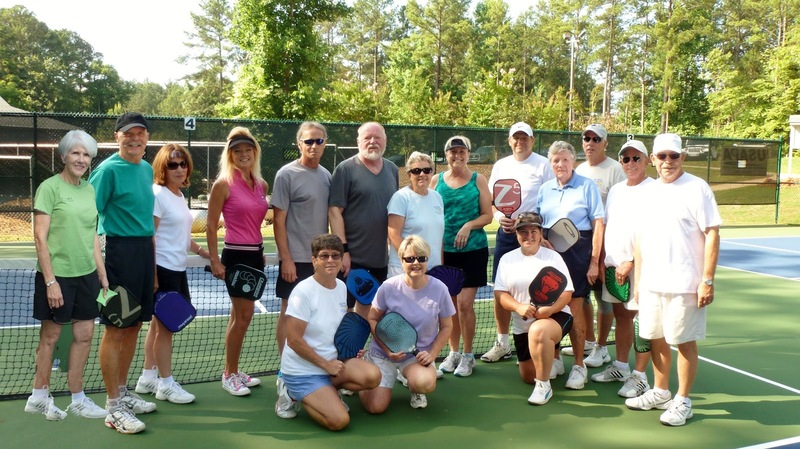 On June 22, six of us traveled 1.5 hours to play Keowee Key Pickleball Club. John Lumpkin, Irma Mason, Jan Sharp (USAPA Ambassador), Paul Baillargeon, Mike and Nancy Falkenstein made the trek. Keowee Key has just completed 4 dedicated Pickleball Courts at the Fitness Center/Racquet Club complex. They have a growing group of PB players (over 100) at all levels of play. With the dedicated courts and such a large group they have designated playing times according to level, i.e. A, B, C ; and also hold introduction and clinic events. The courts are lighted so night play is a very nice option in the summer heat and humidity! Richard Webster is the "Picklemeister" and he is doing a great job. They plan to have a "Men's Play Day" soon and Ladies will follow. After a couple of hours of competetive play, the Blue Ridge Group headed home with a stop for lunch at Lighthouse Point on Lake Keowee. Great time was had by all and future play dates are a certainty. CLICK HERE to see more photos. On June 18, the Franklin USAPA Ambassadors, Jan Sharp, Mike and Nancy Falkenstein presented a program on Pickleball to the Rotary Club of Highlands (NC). The invitation to speak and present was arranged by Joyce Baillargeon, Director of Fitness and Recreation at the Highlands Country Club. The Highlands Director of Parks and Recreation was in attendance and it is hoped tha Pickleball will soon be a part of their program.